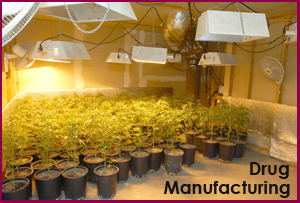 Charges of drug manufacturing is a very serious charge that is often brought against one or more individuals who might cultivate a natural-growing plant such as marijuana or manufacture illegal drugs such as cocaine, heroin, LSD and ecstasy by intentionally mixing chemicals and substances together that results is a drug that is deemed illegal. While law enforcement agencies are pretty successful at finding persons to levy drug manufacturing charges against, the actual prosecution and conviction is significantly more difficult – especially if you are represented by a skilled criminal defense attorney. There’s plenty of room for a competent defense attorney to get drug manufacturing cases dismissed outright or the charges significantly reduced. An experienced Southern California criminal defense attorney, intimately familiar with defending drug crimes in court, can make all the difference to any drug manufacturing case. Trying to do it alone, without having a skilled lawyer at your side is essentially pleading guilty and ending up simply accepting the maximum penalties and punishment that the state can and will deliver. Upshot? There is hope – even if you feel the authorities have a solid case against you. Drug manufacturing charges are not open-and-shut cases. A skilled criminal defense attorney is invaluable to you and the best possible outcome of your case. In many drug cases, police and detectives who were involved in the initial investigation, the arrest and prosecution of an accused drug manufacturing defendant may have committed many procedural errors such as: probable cause, improper search, and evidence collection – that may lead to critical evidence being inadmissible. Only a seasoned criminal attorney will uncover such weaknesses in the states’ case and in many cases these common procedural errors have resulted in the complete dismissal of all charges. Vincent W. Davis has successfully resolved these types of cases for countless clients spanning 26-years of criminal defense. Mr. Davis understands exactly what the prosecution’s burden of proof is and knows how to find the holes in the state’s case. Even if you were charged with having all the necessary ingredients to make batches of methamphetamine, or you own or rent a residence where marijuana is being grown — that does not necessarily make you guilty of a drug crime. Mr. Davis will do everything he can to beat the charges against you and keep you out of jail or prison. Vincent W. Davis’s top top priority is to do everything possible to provide all of his clients with an aggressive and high quality defense, and for the best opportunity for a favorable outcome in court. He will aggressively pursue your freedom in any drug manufacturing crime, and will work tirelessly for clients even when the case may originally appear hopeless.